You must have heard that prophets are dead while infact they are alive. Every soul tastes the death but the body dies, not soul. And, the body of Prophets, Muslim martyrs and true Muslims never decay which is another sign of life in their bodies. So the soul of any human never dies. Starting from this point, you will study proofs from Quran, Ahadiths and other sources on this subject with special thanks to Mufti Muhammad Shafi Usmani, Mufti Muhammad Taqi Usmani, Maulana Ahmad Sadeq Desai, Shaykh ‘Abd al-Hafiz al-Makki, Allamah Zafar Ahmad Uthmani and sevral other Muslim scholars for their efforts. A group of verifiers adduced this hadith as proof that the Prophets (upon them be peace) are alive in their graves. Controversy on this issue has been ongoing in our time, so we will give a brief synopsis here of the [correct] view on this topic. And Allah (Glorified is He) is the Helper. In this topic, a hadith with unequivocal import has been reported which Abu Ya’la transmitted in his Musnad (6:147, no. 3425) from Anas ibn Malik (Allah be pleased with him) that he said: “Allah’s Messenger (Allah bless him and grant him peace) said: ‘The Prophets are alive in their graves, praying’”. Al-Haythami mentioned it in Majma’ al-Zawa’id (8:211) and said: “Abu Ya’la and al-Bazzar narrated it and the narrators of Abu Ya’la are trustworthy”. Al-Dhahabi weakened it in al-Mizan because of al-Hajjaj ibn al-Aswad but al-Hafiz ibn Hajar disagreed with him in al-Lisanand said: “He is al-Hajjaj ibn Abi Ziyad al-Aswad, known as Ziqq al-’Asal and he was Basran … Ahmad said: ‘trustworthy and a pious man’; ibn Ma’in said: ‘trustworthy’; Abu Hatim said: ‘passable in narration’; and ibn Hibban mentioned him in al-Thiqat.” The hadith was also transmitted by al-Bayhaqi in his volume on the life of the Prophets (p. 3) and he authenticated it. Likewise, al-Munawi authenticated it in Fayd al-Qadir. This hadith is further corroborated by what Anas (Allah be pleased with him) narrated in this chapter. Imam al-Bayhaqi devoted a short volume to this issue in which he collected the hadiths which prove the life of the Prophets (peace be upon them). ‘Allamah Jalal al-Din al-Suyuti (Allah have mercy on him) has a treatise on this with the title Inba’ al-Adhkiya’ fi Hayat al-Anbiya’ in which he collected the hadiths related to this issue. From the hadiths which prove the life of the Prophets after their death is the hadith of Aws ibn Aws about the virtue of Friday, in which it is mentioned: “So increase in your blessings on me, for indeed your blessings are shown to me.” Aws said: “They said: ‘O Messenger of Allah! How will our blessings be shown to you when you have decomposed?’ He said: ‘Indeed Allah (Great and Glorious is He) has forbidden the earth to consume the bodies of Prophets.’” Al-Nasa’i, Abu Dawud, ibn Majah, al-Darimi and al-Hakim transmitted it; (al-Hakim) authenticated it and al-Dhahabi agreed with him in Talkhis al-Mustadrak (1:278). In mentioning the perpetuity of his body (Allah bless him and grant him peace) after his death in the context of blessings being presented to him there is an indication that his blessed soul has a connection to his body, and when blessings are shown, it is to both his body and soul, for otherwise there would be no meaning to mentioning the physical body in the answer. From them is the hadith of Abu ‘l-Darda’ (Allah be pleased with him) that he said: “Allah’s Messenger (Allah bless him and grant him peace) said: ‘One does not send blessings on me except his blessings are shown to me until he finishes with it.’” Abu ‘l-Darda’ said: “I said: ‘And after death?’ He said: ‘After death, indeed Allah has forbidden the earth to consume the bodies of Prophets, so the Prophet of Allah is alive and given sustenance.’” Ibn Majah transmitted it. From them is what Abu Dawud transmitted from Abu Hurayrah (Allah be pleased with him) through another route in marfu’ form: “None sends peace on me but Allah restores to me my soul so I can respond to him [by sending him] peace”. Its narrators are trustworthy as al-Hafiz clarified in al-Fath. It may be problematised by [claiming that] the restoration of the soul to the body entails that it was previously detached from the body, which is death, so the hadith only proves that the soul returns upon sending peace. In sum these hadiths, together with the hadith of the chapter, prove the Prophets are alive after their death, and this is the belief of the majority of the Ahl al-Sunnah wa l-Jama’ah. However, at times it is problematised by some people [who ask] how can life be determined for them while unequivocal texts have pronounced that death has overtaken them and they will gather on the Day of Resurrection like all [other] men? This difficulty only arises from a lack of understanding of the meaning of the life established for the Prophets and the martyrs after their death. Some people claim that it is exactly like the worldly (dunyawi) life which they experienced before their death. The truth is that no one says the life of the Prophets is established after their death in this sense. The meaning of their “life” is in the sense that their souls have a strong connection to their noble bodies buried in the graves, and by this strong connection their bodies come to have many unique features from the features of the living, like hearing greetings and replying to them, being preoccupied in worship and other similar things of the said features. The conclusion that is reached by analysing the texts is that although “death” is an expression about the departure of the soul from the body, after death the soul continues to have a connection to the body which it departed, and by this connection the body feels pain at the punishment of the grave and is delighted by the blessings of the intermediary realm (Barzakh), in accordance with the opinion of the majority of the Ahl al-Sunnah that the punishment of the grave happens to the body and the soul. This is the meaning of the soul returning to the body when questioning [the inmate] of the grave and when punishing him as has been recorded in clear texts the authenticity of which has been verified by Ibn al-Qayyim inKitab al-Ruh. The soul being restored to the body after death does not imply resurrection (ihya) after death. Rather it implies only the development of a connection between their bodies and their souls and there is no way of knowing the true nature of that connection. However this connection is not on the same level for all the dead. Thus, the dead differ in the strength and weakness of this connection. Consequently, this connection in the generality of the dead is very weak, since their bodies are consumed by the earth. Hence the designation of “bodily life” is not generally assigned for them after death overtakes them, although some ‘ulama also used the designation of “bodily life” for the restoration of the soul to their bodies. See Ahkam al-Qur’an by al-Jassas (1:185). As for martyrs, the connection of their souls to their bodies is stronger in relation to all the dead to the degree that the earth does not consume their bodies. Thus the Qur’an assigned for them the designation of “living”. If the meaning of their life is intermediary (barzakhi) or spiritual (ruhiyya) only, there would be no difference between them and others. The difference between them and the rest of the dead is that their souls have a strong connection to the bodies. This is the meaning of their bodily lives. As for the Prophets (peace be upon them), the connection of their souls to their noble bodies is the strongest of connections which is conceivable of a man after death has overtaken him. This strong connection affects some of the worldly rules also. Thus, their properties are not divided between their heirs and it is not permissible for one to marry their wives after their death. Our master Abu Bakr (Allah be pleased with him) would spend on them as Allah’s Messenger (Allah bless him and grant him peace) would spend [on them]. As such, the Prophets (peace be upon them) acquired some of the unique features of life which are not established for others besides them after death. Hence, complete and real bodily life is designated for a number of degrees in the connection of the soul to the body, some of them stronger than others. What is established for the Prophets and martyrs after their death is a real bodily life due to the presence of many of the features of the previous life upon death, although it parts with this worldly life, which was established for them before their death, in many [physical] laws. The outcome of this real bodily life is a strong connection of the soul to the body which goes beyond the connection which the rest of the dead acquire. As for discussion about understanding the true nature of this connection it is a discussion about that which man has no means of knowing, for indeed the states of the intermediary realm and the Afterlife is not perceived by these minds [of ours]. Therefore, whoever recognises this much, established by clear texts, and consigns its true nature to Allah Most High, his creed will be safe if Allah Most High wills. As for discussion about the true nature of the states of the intermediary realm and striving to perceive the reality of the connection of the soul to the body or contesting about terminologies of the designation of this connection as bodily life or intermediary life, it is not the concern of the people of truth and not from the path of the people of knowledge. People continue to recognise these realities (haqa’iq) for they are in accordance with the beliefs of the Ahl al-Sunnah wa al-Jama’ah, and there is no need to discuss about its details more than what we have mentioned here. Allah (Glorified is He) knows best. [It was narrated] from Abu Hurayrah (Allah be pleased with him) that Allah’s Messenger (Allah bless him and grant him peace) said: “No Muslim sends peace upon me except Allah restores my soul to me so that I reply to his salutation.” Abu Dawud narrated it with an authentic (sahih) chain, and Ibn Qudamah mentioned it from the narration of Ahmad with the wording: “None sends peace upon me at my grave…” Al-Bayhaqi opened with this [hadith] the chapter on visiting the grave of the Prophet (Allah bless him and grant him peace). A group of the Imams relied on this [hadith] for support of it [i.e. visiting the grave], from them Imam Ahmad. Al-Subki said: “It is a valid support.” Such was mentioned in Wafa’ al-Wafa’ (2:403). I say: The meaning of his (Allah bless him and grant him peace) statement, “except Allah restores my soul to me,” the intent of the restoration of his soul – and Allah knows best – is “spiritual attentiveness” and descending to the planes of humanity from absorption in the Transcendent Presence, since his noble soul is busy in the presence of the [Divine] Presence and the Greatest Company away from this world, so when peace is sent upon him, his soul turns to this world to attain the peace-salutation and to reply to the one who sent peace. This was said by al-Subki as mentioned in Wafa’ al-Wafa’ (2:407). Al-Khafaji said: “That which is apparent in the exegesis of the hadith without affectation is that the prophets and the martyrs are living, and the life of the prophets is stronger, and since the earth is not administered over them they are like sleepers, and the sleeper does not hear and does not speak until he awakens, as Allah (Exalted is He) said: ‘Allah it is who takes away souls at the time of their death, and those which die not in their sleep; then He withholds those on which He has decreed death, and sends back the rest for an appointed term.’ (39:42) Thus, the intent is the “sending back” which is mentioned in the verse, so its meaning is that when he hears the peace-salutation he awakens and replies to it, not that his soul is taken and is then breathed and returned [to him], so there is no [exegetical] dilemma at all.” Such was mentioned in ‘Awn al-Ma‘bud (2:170). Hence, there is no indication in this of the discontinuity of life as some of them assert. ‘Abd al-Haqq (d. 581 H) narrated in al-Ahkam al-Sughra – and he said “its chain is authentic” – from Ibn ‘Abbas (Allah be pleased with them), he said: Allah’s Messenger (Allah bless him and grant him peace) said: “No one passes by the grave of his believing brother that he knew and he sends peace upon him, except he will recognise him and return his salutation.” Ibn ‘Abd al-Barr also narrated it and authenticated it as transmitted by Ibn Taymiyyah. Ibn Abi al-Dunya narrated from Abu Hurayrah (Allah be pleased with him), he said: “When a man passes by a grave whose [inhabitant] he knew, and he sends peace upon him, he returns his salutation and recognises him; and when he passes by a grave whose [inhabitant] he did not know and he sends peace upon him, he returns his salutation.” The narrations with this meaning are many. Ibn Taymiyyah mentioned in Iqtida’ al-Sirat al-Mustaqim that the martyrs, rather all believers, when a Muslim visits them and sends peace upon them, they recognise him and reply to their salutation. Since this is about the individuals of the believers, what about the master of the messengers (Allah bless him and grant him peace)? A clear mention of his (Allah bless him and grant him peace) hearing the peace-salutation of a visitor is mentioned in a narration narrated by a group from Abu Hurayrah (Allah be pleased with him) with the wording: “Whoever sends blessing on me near my grave, I hear it, and whoever sends blessing on me from afar, it reaches me.” In it is Muhammad ibn Marwan al-Suddi al-Saghir who is weak, and al-Khallal narrated the like of it through the route of al-Buhtari who is very weak from ‘Ubayd Allah ibn ‘Umar from Nafi‘ from Ibn ‘Umar raised [to the Prophet (peace and blessings be upon him)] with the wording: “Whoever sends blessing on me near my grave, I reply to him, and whoever sends blessing on me from another place, they send it to me.” Multiple paths offer strength. Al-Subki said: “What indicates that he (Allah bless him and grant him peace) hears one who sends peace on him near his grave and he replies to him, knowing his presence, is to come. And this is sufficient as a true virtue for the king of the world to spend until he reaches it [i.e. the blessed grave] from the furthest regions of the world.” End quote from Wafa’ al-Wafa’ summarised (2:404). There is no doubt in his (Allah bless him and grant him peace) life after his departure, and likewise all the remainder of the prophets (upon them blessing and peace) are living in their graves, a life more complete than the life of the martyrs which Allah Almighty gave information of in is Mighty Book, and our Prophet (Allah bless him and grant him peace) is the master of the prophets and master of the martyrs and the deeds of the martyrs are in his scale. He (Allah bless him and grant him peace) said: “My knowledge after my death is like my knowledge during my life.” Hafiz al-Mundhiri narrated it. Ibn ‘Adi narrated in his Kamil from Thabit from Anas (Allah Almighty be pleased with him), he said: Allah’s Messenger (Allah bless him and grant him peace) said: “The Prophets are living in their graves, praying.” And Abu Ya‘la narrated it with trustworthy narrators, and al-Bayhaqi narrated it and authenticated it. Ibn Majah narrated with a good chain as said by al-Mundhiri from Abu al-Darda’, he said: Allah’s Messenger (Allah bless him and grant him peace) said: “Increase in sending blessing on me on Friday for it is attended by angels, and no one sends blessing on me except his blessing is shown to me when he finishes with it.” I said: “And after death?” He said: “And after death. Verily, Allah has forbidden the earth from consuming the bodies of prophets, so the prophet of Allah is living and sustained.” This is the wording of Ibn Majah. It is not contradicted by what Thabit narrated from Anas (Allah be pleased with him) raised [to the Prophet (peace and blessings be upon him)] that “the prophets are not left in their graves after forty nights, but they pray in front of Allah until the trumpet is blown” since Ibn Abi Layla is in its chain and he had a bad memory so the contradiction of what he narrated with the hadiths of trustworthy narrators is unacceptable. Al-Bayhaqi said: “Even if it is authentic with this wording, the intent is – and Allah knows best – they are not left not praying except for this period, and then they begin to pray in front of Allah Almighty.” End quote from Wafa’ al-Wafa’ summarised (2:405,6). I say: Its outcome according to this is that the prophets are not like other than them from the children of Adam that when they die, their deeds are cut off, rather their deeds continue after death also, and it does not cease but for forty nights. Allah Almighty knows best. The following refutation by Maulana Ahmad Sadeq Desai against a Salafi whom he refers to as “coprocreep”, adequately deals with most of the common objections to the position held by the Ahlus Sunnah Wa’l Jama’ah for 1400 years. The very first essential principle to understand regarding the Ulama of Deoband is that when we say ‘Ulama of Deoband’, the reference is not to mediocre Molvis who had acquired knowledge at Deobandi Darul Ulooms nor to any Ulama who have deviated from the Minhaaj of the Akaabir Ulama of Deoband. When the term ‘Ulama of Deoband’ is used it refers to Giants and Stars of Ilm and Taqwa such as Hadhrat Maulana Qaasim Nanotwi, Hadhrat Maulana Rashid Ahmad Gangohi, Hadhrat, Hadhrat Maulana Khalil Ahmad Ambetwi, Hadhrat Maulana Ashraf Ali Thanvi (rahmatullah alayhim), and to the glittering galaxy of senior Ulama-e-Haqq associated with Darul Uloom Deoband. These illustrious Souls are the Seal of the Ulama of Deoband. Any view which clashes with the unanimous stance of these noble Ulama of Deoband, is never the view of our Ulama (the Ulama of Deoband). It should be well understood that Darul Uloom Deoband has long ago been infiltrated by men of the Maudoodi sect and men with Salafi leanings and views. Thus, any conflicting view tendered by such miscreants who happened to have studied at Darul Ulooms linked to Deoband is never the view of the Ulama of Deoband. On this issue there is no difference of opinion among the Ulama of Deoband. (Bear in mind who the Ulama of Deoband are!). According to the Qur’aan, Sunnah and Ijma’ of the Ummah, the Ambiya (alayhimus salaam) are alive in Barzakh, and so are the Shuhada (the Martyrs). However, it is quite obvious that the Hayaat of the Ambiya (alayhimus salaam) is of a higher state than the Hayaat of the Shuhada. Furthermore, all mankind, including the kuffaar, have life in Barzakh. The questioning in the grave, the torments and pleasures in the grave, etc. are all related to Barzakh. These states are not related to inanimate objects such as stones. It is therefore, simple logic that the Hayaat if the Ambiya (alayhimus salaam) in Barzakh will not be of the same level as the ‘hayaat’ of the kuffaar in Barzakh. Ulama of Makkah, Madinah, Egypt and Damascus, of all Four Math-habs, lauded accolades on Allaamah Khalil Ahmed and concurred with his answers which were unanimously confirmed to be the Aqaaid of the Ahlus Sunnah Wal Jama’ah while paying glowing tribute to him for stating the Haqq with clarity. Thus, the attempt by the coprocreep to create the false impression that the Hayaat belief of the Ulama of Deoband is in conflict with the belief of the Ahlus Sunnah is most despicable and dismissed with the contempt it deserves. The coprocreep, in subservience to the Saudi Salafis and other deviated ghair muqallideen are notorious for their Shiah-type taqiya stunts. Deceit is their salient feature. Therefore, the coprocreep speaks as if the Ulama of Deoband are alone in the belief of Hayaat, i.e. the concept of the Hayaat of the Ambiya to which the Ulama of Deoband subscribe. The argument of Nabi Musa (alayhis salaam) performing Salaat in his grave has not been originated by the Ulama of Deoband. Shaikh Taqiuddin Subki mentions it, and Imaam Suyuti narrated it. This fact alone should be sufficient to dispel the falsehood that the concept of Hayaat propagated by the Ulama of Deoband is not the belief of the Ahlus Sunnah Wal Jama’ah. While there is complete consensus on the issue of Rasulullah’s Hayaat after his earthly demise, the precise details of this concept are not explained in the Qur’aan and Ahaadith. No one has the right to claim that his personal understanding of an ambiguous concept has the status of Wahi. It suffices to say that the concept to which the Ulama of Deoband subscribe has not been originated by them. It has come to them from the Salf-e-Saaliheen by way of authentic narration. We therefore find that the Maaliki, Shaafi’, Hanafi and Hambali Ulama of the Haramain Shareefain upholding the elaboration tendered by Hadhrat Allaamah Khalil Ahmad. If the concept of the Ulama of Deoband was an innovation, the Ulama of the Haramain Shareefain, Damascus and Egypt would not have concurred. The ‘rational’ arguments which the coprocreep presented in no way whatsoever succeeds in making even a kink in the belief propounded by the Ulama of Deoband in view of the fact that their view is the view of the Four Math-habs. Logic may not be tendered as a daleel for refuting what has been established and upheld by the narration of the Four Math-habs. There is no factor (murajjih) to confer preference to the conjecturing of the coprocreep and his Salafi cohorts. On the contrary, the established view of the Four Math-habs is as old as Islam, and it totally eliminates any conflicting concept. The ‘impossibility’ is a figment of corrupt and defective understanding. The concept of the Ahlus Sunnah presented by Allaamah Khalil Ahmed (rahmatullah alayh) in his kitaab, Al-Muhannad, was firstly upheld and lauded by the Ulama of the Four Math-habs of Haramain Shareefain, Damascus and Egypt. Secondly, it was never contended that Rasulullah (sallallahu alayhi wasallam) was in two different physical abodes at one and the same time. The simple explanation is that the dunyawi dimension of Hayaat of the Ambiya (alayhimus salaam) exists in one realm, the Realm of Barzakh. There is neither a rational impossibility nor a Shar’i impossibility to preclude the validity of this concept. It is the belief of the Ahlus Sunnah Wal Jama’ah that punishment in Barzakh occurs to the physical body as well. Furthermore, in the life Hereafter, it will be a physical life – a dunyawi life. By ‘dunyawi’ is not meant existence on earth. It refers to the physical nature of life. There is no daleel to deny the reality of dunyawi (physical) existence of Insaan in Barzakh and in Qiyaamah. Dunyawi does not mean the world. It is an adjective describing worldly attributes. Therefore, the contention that Rasulullah (sallallahu alayhi wasallam) is postulated to be in two physical abodes at one and the same time is baseless and absurd. This stupid analogy confirms that the coprocreep is unaware of the meaning of Mahaal-e-Aqli (rational impossibility). It will serve him well to gain re-admission to a Madrasah to acquire the basic knowledge of mantiq (logic) to enable him to understand the meaning of ‘impossible’. The idea that one plus one equals three is a rational impossibility. But, to imagine an animal with a 100 heads is not mahaal-e-aqli. It is not a rational impossibility despite it not being a normal possibility. There is no valid rational reason for contending that a human being has no physical existence – his physical body with his worldly personality – in Barzakh. According to the Hadith, the qabr of the successful Mu’min will be increased manifold in size and a variety of comforts will be bestowed to him. On the other hand, terrible punishment in the grave awaits the kuffaar and the disobedient Muslims. This comfort and torment will be meted out to the dunyawi body and soul of man in Barzakh. It is thus plain stupidity and density of brains corrupted by stercoracious substances of dhalaal to deny the possibility, in fact, the established belief of physical punishment/reward in Barzakh. To which ‘rules’ is he referring? If he is alluding to the rules of the Shariah, no one has ever contended that such rules are applicable in Barzakh. In fact, Allaamah Khalil Ahmed (rahmatullah alayh) in his answer explicitly makes mention the terms ‘min ghair takleef’. Whatever the coprocreep means by ‘rules of the dunya’, no one has claimed that the ‘rules of the dunya’ apply to Barzakh. 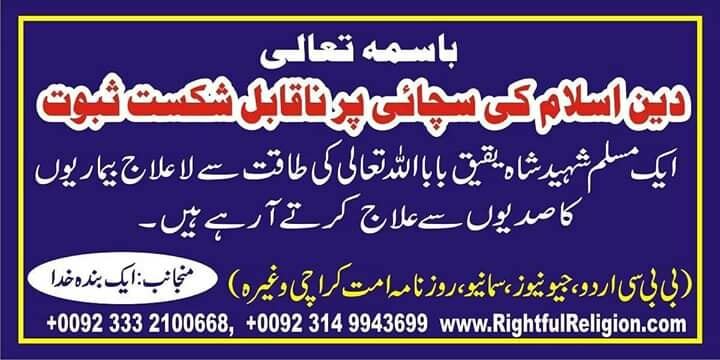 However, this non-applicability does not negate the existence of a dunyawi personality in Aalam-e-Barzakh. There is no daleel for substantiating such a contention, neither Shar’i nor rational. Before demolishing the coprocreep’s self-contradictory statement, it is necessary to comment on his use of the name ‘Jesus’ for Hadhrat Nabi Isaa (alayhis salaam). Perhaps he is one of the interfaithers who subscribe to the kufr doctrines of the interfaith movement financed and espoused by the Saudi king. What constrains a Muslim when addressing other Muslims to refer to Hadhrat Nabi Isaa (alayhis salaam) with the Christian kufr name of ‘Jesus’? Let him search his heart. In the aforementioned averment the coprocreep switches, but not dexterously, from ‘dunyawi’ to dunya. Who had claimed that the Ambiya to whom Rasulullah (sallallahu alayhi wasallam) spoke on the Night of Mi’raaj were in the dunya? This episode of Mi’raaj is cited by the Ulama-e-Haqq to support the rationality of the belief that the Ambiya were with their dunyawi personalities in Barzakh. The coprocreep, in his statement, has conceded that Rasulullah (sallallahu alayhi wasallam) with his physical body – his dunyawi personality – addressed the Ambiya in Barzakh. So how was this possible? By a miracle he was in two different houses at one and the same time? If the ‘miracle’ had made the ‘impossibility’ of the coprocreep possible on the Night of Mi’raaj, what precludes the re-enactment of the ‘miracle’ after the demise of Rasulullah (sallallahu alayhi wasallam)? In this averment, the coprocreep has trapped himself in a self-contradiction. Earlier he had claimed that this was impossible, now by the ‘miracle’ the impossible has become possible. The whole Mi’raaj from beginning to end was one wonderful Miracle. It was the command of Allah Azza Wa Jal. How can it be impossible for Allah Ta’ala to decree a dunyawi existence for the Ambiya in Barzakh? Again, we should remind the coprocreep that by ‘dunyawi’ is not meant the world. It is not being suggested that the Ambiya are in two different abodes at one and the same time. The Ambiya (alayhimus salaam) were performing Salaat in Barzakh. Rasulullah (sallallahu alayhi wasallam) observed them with their dunyawi bodies performing Salaat. They were not invisible celestial souls whom Rasulullah (sallallahu alayhi wasallam) saw and spoke to. Another interesting fact is that whislt the Ambiya (alayhimus salaam) were in their Barzakhi life, they all were present in Musjidul Aqsa on the Night of Mi’raaj, where Rasulullah (sallallahu alayhi wasallam) led them in Salaat. Regardless of what interpretation is tendered, the fact remains that the Ambiya were present on earth during their Barzakhi life. This as well as many episodes of the Shuhada confirm that whilst they are in Barzakh they do appear on earth with Allah’s permission. Their Barzakhi life is undeniable, and so is the dunyawi dimension. The coprocreep’s confusion stems from his deficient understanding of the term ‘dunyawi’. He has stupidly concluded from this word that the belief of the Ahlus Sunnah Wal Jama’ah entails the notion of Rasulullah (sallallahu alayhi wasallam) being in two different abodes at one and the same time. A being in Barzakh can, with Allah’s permission, make an appearance on earth or any where else in Allah’s universe, whilst he will still be in the state of Barzakh. His appearance on earth such as the appearance of the Ambiya (alayhimus salaam) in Musjidul Aqsa on the Night of Mi’raaj, does not negate the fact that they were in Barzakh. Barzakh is not a fixed physical abode such as the earth with geographic frontiers. It is the existence of human life after Maut until Qiyaamaah. While that phase of life in relation to man is described ‘Barzakh’, it is not Barzakh for the Angels who are present during this phase of human life. Wherever Allah Ta’ala allows the deceased person to reside or be in Barzakh, he/she will occupy that abode without Barzakh being negated. Thus, Rasulullah (sallallahu alayhi wasallam) being in his Qabr Shareef with his blessed worldly (dunyawi) body in no way whatsoever negates Barzakh. The physical body can and does exist in Barzakh. The earth does not consume the blessed bodies of the Ambiya and the Shuhada. Wherever Allah Ta’ala allows them to reside after their demise, that place is in the Realm of Barzakh notwithstanding the endurance of their physical (dunyawi) bodies and personalities. The coprocreep has spoken absolute rubbish. He is ignorant of the Shariah’s concept of Barzakh. The logical conclusion of this question is that he does not believe in the Hayaat of the Ambiya (alayhimus salaam). If this is indeed so, then Allah have mercy. This answer annihilates the erroneous conclusion the coprocreep has made regarding his imagined inconsistency relative to the belief of life in Barzakh for the Ambiya and the Shuhada. The Shuhada do enjoy a similar kind of life although of a lower category than the life of the Ambiya (alayhimus salaam). The claim that ‘levels of life’ do not exist in Barzakh is stupid and baatil. A high degree of Aql is not a requisite for understanding that a Muslim fornicator, bandit and murderer even if he has been forgiven will not occupy the same lofty level of life in Barzakh and Jannat as the Ambiya would. The contention of the coprocreep is astonishingly absurd. Will criminals and the Shuhada have the same level of life in Barzakh? And, for even the Ambiya (alayhimus salaam) there will be different levels. The Qur’aan Majeed is explicit in stating that some Ambiya have higher ranks than other Ambiya. This difference in rank will not be obliterated in Barzakh, nor in Jannat. Islam does not propagate the communist doctrine of a classless society. Even in Jannat it will not be a classless society. There will be ranks above ranks, not only among the Ambiya and Shuhada, but also among the ordinary Mu’mineen. This argument of the coprocreep is too stupid to pursue further. The coprocreep accuses the Ulama of Deoband of equating the life of Barzakh to the life of the world. The density of his sensorium constrained him to arrive at this stupid conclusion. No one has equated the superior life of the Ambiya (alayhimus salaam) in Barzakh to the inferior life of this world. The attributive word, ‘dunyawi’ is not an equation. It does not equate the superior life of Barzakh to the worldly life. It only explains man’s physical attributes and personality which constituted him in the world. These attributes and personality will not be annihilated in Barzakh. Insaan will remain Insaan in Barzakh. There is Hayaat for all human beings in Barzakh. But, the Hayaat of the Ambiya (alayhimus salaam) is of the highest category. If life in Barzakh is negated, what then is the meaning of reward, comfort pain and punishment in the Qabr? What is the meaning of the questioning in the grave if hayaat is negated? The coprocreep compounds his rubbish with more and more rubbish. The Qur’aanic negation of ‘death’ for the Shuhada is the death as understood by human beings. The Qur’aan explicitly says: “Do not say that they are dead.”, despite the fact that they had died an earthly death – death as man understands it. The ‘life’ which the Shuhada have been granted is life which is the opposite of earthly death, hence the emphasis: “In fact, they are alive.” The Qur’aan tells us that they are alive just as we are alive here on earth prior to earthly death. In addition to them being alive, they are enjoying a variety of bounties and are being given sustenance (food) to eat. Now when the Qur’aan Majeed confirms dunyawi life, albeit of a superior kind, for the Martyrs, then by what stretch of Islamic logic do the juhhaal deny this type of superior dunyawi life for Rasulullah (sallallahu alayhi wasallam) in particular, and the Ambiya (alayhimus salaam) in general? There is neither logical impossibility nor Shar’i impossibility for the existence of this type of life in Barzakh. And, if it appears ‘impossible’ to the fossilized sensorium of coprocreeps, it matters not. The density of brains of deviates constrains them to deny simple and self-evident Qur’aanic facts. The fact that the bodies of the Ambiya (alayhimus salaam) and of the Shuhada do not decompose, is further evidence for the bestowal of dunyawi (i.e. physical) life of a lofty kind. It is undeniable to even the Salafis that the Ambiya (alayhimus salaam) and the Shuhada are in Barzakh. By accepting that their bodies are intact, they have no logical reason for refuting the presence of the physical bodies of the Ambiya and Shuhada in Barzakh. Now whether their bodies are in the physical graves or transferred to some other abode, their presence in Barzakh is undeniable. Barzakh is not a physical abode with territorial boundaries such as the earth. It is therefore downright jahaalah to contend that a being cannot be in Barzakh and on earth at one an the same time. The impossibility would develop only if Barzakh was a distinct physical abode with physical boundaries. But Barzakh is a phase of existence which commences from after Maut and endures until Qiyaamah. The coprocreep, we are sure, unless we are mistaken, believes that the mubaarak body of Rasulullah (sallallahu alayhi wasallam) is not the subject of decomposition. His body is intact. Now where is the mubaarak physical body of Rasulullah (sallallahu alayhi wasallam). Wherever it is, it is the physical body in the state of Barzakh. This is the meaning of dunyawi life which is a special bounty awarded to the Ambiya (alayhimus salaam) and the Shuhada. Everything in creation is the ‘divine law’ of Allah Ta’ala. Nothing happens without His command. The Ahlus Sunnah do not contend that mere preservation of the physical bodies is the basis of the belief of the post-Maut Hayaat of the Ambiya (alayhimus salaam) and the Shuhada. A dead body could be preserved for ages in a deep freezer without it decomposing. No one will say that such preservation is a sign of worldly life. Nevertheless, the body preserved intact in a deep freezer on earth is in the state of Barzakh. Physical presence on earth does not negate the existence of Barzakh. While it is quite possible for the bodies of the Ambiya (alayhimus salaam) and of the Shuhada to remain intact without life by the command of Allah Ta’ala, it is kufr to subscribe to such a corrupt belief because to do so would be in denial of the Qur’aan and other proofs stated in the Ahaadith. The Qur’aan explicitly and emphatically declares life for the Shuhada, and warns against saying they are dead. Allah Ta’ala is addressing human beings and mentioning Maut and Death to them as they understand these two states. The Qur’aan tells us to refrain from saying that the Shuhada are dead – dead in the worldly sense, despite them having died a physical death. While their physical death is undeniable, it does not follow that no revival and restoration to physical life takes place in Barzakh. Aside from the fact that this is not a logical impossibility (mahaal-e-aqli), it is expressly confirmed in the Qur’aan that they are alive – alive in the way we understand life to be. The relevant aayaat stating the Hayaat of the Shuhada are not among the Mutashaabihaat (allegorical verses). They are matter of fact verses with literal meanings. Furthermore, what exactly does the coprocreep mean by ‘worldly life’? It devolves on him to expound his theory of ‘worldly life’ to enable us to respond with greater clarity. Does he mean that the Ambiya (alayhimus salaam) and the Shuhada are dead, i.e. bodies without souls in Barzakh? But the Qur’aan says that they are alive – alive in the worldly meaning. This does not mean that they are living a worldly life as they lived prior to their death. It only means that their physical bodies are together with their souls. In other words they are completely Insaan (human), having their senses all intact, in fact to a far greater degree. Allaamah Ibn Hajar states: “Baihaqi has authenticated this Hadith.” (Fathul Baari, Vol.6, Page 352). “From the time of Khairul Quroon until the 14th century there was no difference in this mas’alah. All the Akaabir had elaborated on this mas’alah in their writings in their own style. Among the Akaabir of the Aslaaf some had written special treatises on this subject (the Hayaat of Rasulullah- sallallahu alayhi wasallam). They had substantiated with clarity the issue of the Hayaat of the Ambiya. It is a clear issue and a belief on which there exists the Ijma’ of the Ummah. The coprocreep following blindly his jaahil Salafi handlers is at pains to show that the belief of Hayaat of the Ambiya (alayhimus salaam) has been invented by the Ulama of Deoband about one and half centuries ago. He abortively tries to conceal the irrefutable fact that many centuries before the existence of Darul Uloom Deoband, this belief was entrenched in the Ummah, and that it has come down from the Khairul Quroon. Neither Imaam Suyuti nor Allaamah Subki, who both were Shaafis, was among the Ulama of Deoband. Darul Uloom Deoband had not even existed in that era many centuries ago. So why does the miserable coprocreep single out the Ulama of Deoband for his baseless criticism? The Saheeh riwaayat of Hadhrat Anas (radhiyallahu anhu) who is among the most senior Sahaabah, dismisses the rubbish belief of the coprocreep and his Salafi bosses. The stupidity of this argument is self-evident. But only morons fail to discern the stupidity. That Rasulullah (sallallahu alayhi wasallam) died a physical death in this world has never been denied. The Qur’aan also testifies that death will overtake Rasulullah (sallallahu alayhi wasallam). The issue does not revolve around denial of his physical death – death as it occurs to all human beings. The issue is his life in Barzakh. The contention of the Ahlus Sunnah is that in Barzakh the Ambiya (alayhimus salaam) enjoy a superior form of life – a life in which their bodies and souls exist together in the form of human beings. They are not in an abstract spiritual state. When the Qur’aan Majeed explicitly confirms such physical life for the Shuhada, then to a greater degree by way of Dalaalatun Nass, will the Ambiya (alayhimus salaam) be enjoying a physical life in Barzakh of a higher degree than even the Shuhada. With regard to the subsistence of Rasulullah’s marriages to his wives, this is a contentious issue among the Ulama. While some Ulama maintain that the marriages of Rasulullah (sallallahu alayhi wasallam) subsisted even after his earthly death, others do not subscribe to this belief. However, the belief of the Hayaat of the Ambiya(alayhimus salaam) and the Shuhada is not based on the subsistence of Rasulullah’s Nikahs nor on the fact that the Ambiya do not leave an estate for inheritance. These are subsidiary issues which are presented to bolster the original belief of Hayaat which is not reliant on these masaa-il. While the coprocreep calls on us to base our case on only the Qur’aan and Sunnah, he is in total denial of the Qur’aan by refuting Hayaat of the Ambiya (alayhimus salaam) and the Shuhada. What constrains these deviates to interpret away the verses stating emphatically the physical life of the Shuahada? They are falsifying the Qur’aanic aayaat solely to bolster the corrupt belief of their deviant Imaam. One of the fundamental issues of sharp conflict between the Ahlus Sunnah Wal Jama’ah and the Wahhaabi Salafis is the belief of Rasulullah’s Hayaat in his blessed Grave. While the deviates deny Hayaat for Rasulullah (sallallahu alayhi wasallam), the Ahlus Sunnah affirm it. They also deny the authentic Hadith of Hadhrat Anas (radhiyallahu anhu) who explicitly mentioned that the Ambiya are alive in their graves and perform Salaat. We have already cited above the references for the authenticity of this Hadith. Thus, the coprocreep blindly follows his deviant handlers whose corrupt beliefs he laps up like a dog licking up vomit. 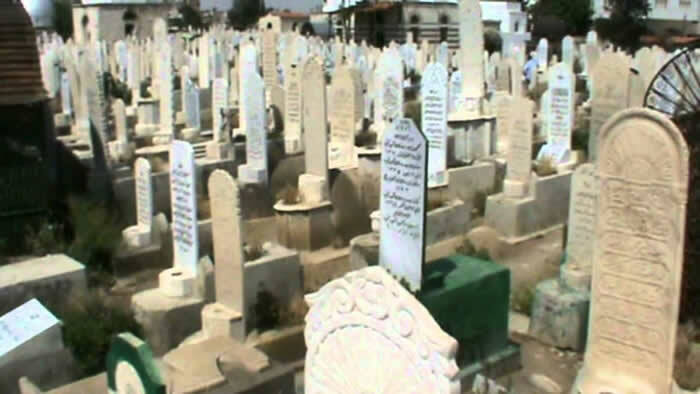 The belief of the Hayaat of the Ambiya in their Graves is based on the Qur’aanic verse in which the Hayaat of the Shuhada is explicitly mentioned, and on the Ahaadith such as the narration of Hadhrat Anas (radhiyallahu anhu) who states this belief with great clarity, and on other Ahaadith in which it is mentioned that Rasulullah (sallallahu alayhi wasallam) saw the Ambiya performing Salaat, and their performing Salaat behind him in Musjidul Aqsa. This is a belief which has come down in the Ummah from the age of the Sahaabah. Coprocreeps and the miscreant Salafis are in denial since they have strayed from the Siraatul Mustaqeem. The first to deviate from Siraatul Mustaqeem regarding this belief was Ibn Hazam who denied the return of the souls of the Ambiya to their bodies. In his concept, ‘hayaat’, means the life of the soul – only a spiritual existence. This is palpably false since the Qur’aan categorically prohibits us from saying that the Shuhada are dead. The Qur’aan unequivocally say that they (i.e. the Shuhada – body and soul) are alive and by Allah they are being fed.) Allah Ta’ala addresses all the Mu’mineen and speaks to us in the terms that we understand. In order to refute the baseless notion of Ibn Hazam, the Ulama deemed it incumbent to describe the life of the Ambiya in the graves with the term ‘dunyawi’. In other words, they are alive with their physical bodies. Their existence in the graves is not on the same level as the life of the ordinary Muslims and of entire mankind which includes the kuffaar. It is contumacious to even suggest that the hayaat of the Ambiya is the same as the hayaat of even the kuffaar who are all living in Barzakh at a level far below the lofty status and form of the Ambiya. “Rasulullah (sallallahu alayhi wasallam) is alive in his Qabr and he performs Salaat. Alhamdulillah, the coprocreep’s alleged 3rd and 4th inconsistencies are devoid of Shar’i and logical arguments. The Salafi belief regarding the Hayaat (Life) of Rasulullah (sallallahu alayhi wasallam) is baatil. Translator — The article below was published in Roshni, a religious supplement published each Friday with the Saudi-based Urdu News newspaper, in clarification of a column published a few weeks earlier, discussing a story about a man who was told on his death bed that he had been forgiven due to his devotion to sending Blessings and Peace (Salat wa Salam) to the Prophet (Allah bless him and give him peace) each morning. Regarding the hadith about the deeds of the Umma being presented to the Messenger of Allah (Allah bless him and give him peace), Dr ‘Abidi, in an unbefitting fashion, writes: “Were the actions of the Companions (may Allah be pleased with them) also presented to the Messenger of Allah (Allah bless him and give him peace) when he was alive? So, how and for what reason are they presented after the Messenger of Allah’s (Allah bless him and give him peace) death?” Such boldness and disrespect is totally inapt. The question of why actions are presented [as mentioned by Dr 'Abidi in his article] remains. However, the Messenger of Allah has clarified this in that very hadith: “Whatever good I shall see, I shall praise Allah for that; and whatever bad I shall see, I shall seek repentance on your behalf.” The purpose has been explained by the Prophet of Guidance and Mercy (Allah bless him and give him peace) himself — something at which Dr ‘Abidi and all of us should rejoice. May Allah Most High, through His bounty, accept the Messenger of Allah’s (Allah bless him and give him peace) repentance on our behalf and forgive us all of our sins. Amin. What remains now is the issue surrounding this hadith, which Dr ‘Abidi has separated into two parts and then individually explained at great length. Regarding this, it suffices to say that senior hadith scholars — those who have an extremely high standing in the subject — have considered it to be authentic (sahih). It is the words of these experts and specialists that will be relied upon and accepted. Personal opinions that run contrary to the views of these masters of hadith will definitely not be deliberated on. This is an accepted principle. Hafiz ‘Iraqi says the chain of narration (isnad) of this hadith is excellent (jayyid). Imam Hafiz Haythami also mentions the same in Majma’ al-Zawa’id and writes that Imam Qastallani, the commentator of Sahih al-Bukhari, considers it to be authentic (sahih). The great hadith scholar, Mulla ‘Ali al-Qari has also mentioned it to be authentic in Sharh al-Shifa and writes that Imam Jalal al-Din al-Suyuti has mentioned it to be authentic in his books. Imam Munawi has mentioned it to be authentic in Fayd al-Qadir, likewise, Imam Zurqani in Sharh al-Mawahib has considered it to be authentic and so has Imam Shihab al-Khafaji in Sharh al-Shifa. In addition, the hadith has been narrated mursal from a different chain of narration — this has been mentioned by Hafiz Isma’il al-Qadi in Juz’ al-Salat ‘ala ‘l-Nabi. Shaykh Nasir al-Din al-Albani writes that it is mursal sahih and Hafiz Ibn ‘Abd al-Hadi al-Hanbali has mentioned it authentic in his book Al-Sarim al-Munki. The great hadith scholar ‘Allama ‘Abd Allah al-Ghumari has also penned a booklet, entitled Nihayat al-Amal fi Sihha wa Sharh Hadith ‘Ard al-’Amal, solely on this hadith. Further to this, Hafiz Ibn al-Jawzi — who has been quoted by Dr ‘Abidi, and who is considered to be among those hadith scholars known for their critical research and stringency — has penned a brilliant two-volume book on the Prophet’s life, entitled Al-Wafa bi Ahwal al-Mustafa (Allah bless him and give him peace). In its introduction to the book, Hafiz Ibn al-Jawzi writes that he has only included authentic hadiths and kept it completely clear of lies. Hafiz Ibn al-Jawzi also devotes an individual chapter comprising three hadiths to the subject — Al-Bab al-Sabi’ wa w’l-Arba’un fi ‘Ard ‘Amal Ummatihi ‘Alayh (The Forty-Seventh Chapter Regarding the Presentation of His Umma’s Action to Him). The second hadith is the one mentioned by Dr ‘Abidi — not the one from Sayyiduna ‘Abd Allah ibn Mas’ud, but one from Bakr ibn ‘Abd Allah al-Muzani, which is mursal and which Shaykh Albani says is mursal sahih. In sum, it can be said that the hadiths about the presentation of deeds — including the presentation of Peace and Blessings, as that is also a deed — have been narrated from three individuals: Sayyiduna ‘Abd Allah ibn Mas’ud, Sayyiduna Anas ibn Malik and Bakr ibn ‘Abd Allah al-Muzani. One who dies in the cause of Allah is a Shahid (Martyr) and, although, it is correct and even allowed to call him “dead”, yet we are forbidden to regard their death like ordinary deaths. For, though, life in Barzakh is given to everybody which gives him perception of reward and punishment but Shahid in the Barzakh life is qualitatively different from the one given to other persons. The distinction a Shahid has over others in Barzakh is that in effect, for the fullness and sensitivity of life, his perception is, keener and deeper. As, for instance, the life sensation is there in finger tips, as also, it is there in heels, but the sensitivity of finger tips is sharper than that of heels. The effect of the finer life-quality of a Shahid in Barzakh reaches his physical body as well; whereas ordinarily bodies remain unaffected. Consequently, a Shahid’s body does not waste away, decay or mingle with dust. On the contrary it retains it freshness and a semblance of being alive too. This is duly endorsed by Ahadith and observations. They are, therefore, reported as living and we are forbidden to call them dead. However, for all worldly purposes they are treated at par with the dead; their properties are divided and their wives can remarry. Lives of prophets in Barzakh have a further distinction. Their life-sensitivity is even finer and keener than that of Shahids. In Barzakh their bodies retain their life-quality and, in some ways, its manifestation is extended to this life as well; their properties are not divided and their wives cannot again enter into wedlock. The most strong in the retention of this life-quality are the prophets, then are the Shahids, then the ordinary human beings. Nevertheless, according to some ahadith some of the men of Allah and virtuous people share this excellence with Shahids. Apparently, those who die while exercising stringent discipline against their selves (Mujaahidatun Nafs) are ranked with Shahids. In other words, though this verse specifically refers to Shahids as against the broad humanity, it does not, for that reason, exclude the virtuous and the truthful. If, therefore, the body of a Shahid returns to dust, as bodies of ordinary persons, generally do, the chances are that the person did not, perhaps, die in the cause of Allah which is the only criterion of martyrdom (Shahadah). In case a person who fulfilled all the prerequisites of martyrdom and, beyond, any doubt, died in the cause of Allah and whose martyrdom (Shahadah) has been unmistakably and repeatedly demonstrated, his body must not, on the authority of a hadith, return to dust. If, in spite of Ahadith, the body mingles with earth (what, in fact, has made the author of Ruh al-Ma’ani doubt is how can, in spite of Ahadith, the body of a Shahid be eaten away by earth) the explanation would be that according to Hadith the body would not return to dust; however, it does not deny the process of decay and decomposition caused by other factors like geo-chemical reaction, body enzymes, and bacteria. Neither does it confute the verse. Other compound objects like weapons, medicines, food, and the commingling of various natural elements like water, fire and air had, undoubtedly, their effects on the bodies of prophets in this world and, obviously, the life-quality of Shahid in Barzakh is not superior to that of the prophets in this world; if, therefore, the other ingredients register their impact on the bodies of Shahids in Barzakh it does not confute, in any sense, the meanings of Ahadith which say the Shahids bodies are sacred to earth. Another answer is that the distinction which Shahids have over others is apparent from the fact that, comparatively, their bodies remain unspoiled for a pretty long time, although the liklihood of their disentegration in the longer run does exist. The aim of the hadith should, therefore, be explained by saying that the immunity from decay for such a long time is, in itself, an excess on the customary behaviour of dead bodies. Eternal preservation, and preservation for a considerable long time, both are an “excess on the customary behaviour” of dead bodies. By the words, “Laa Tash’aroon”: “you perceive not”, the Holy Qur’an asserts the fact that the life in Barzakh transcends all sensory perceptions. His statement “he hears the noise”: this hadith is a proof for those who affirm the hearing of the dead and this is the position of ‘Abdullah ibn ‘Umar (Allah be pleased with him). Ibn ‘Abd al-Barr (Allah have mercy on him) mentioned that it is the preferred view of ibn Jarir al-Tabari, ibn Qutaybah and most of the ‘ulama. It was narrated from ‘A’ishah (Allah be pleased with her) that she opined that the dead do not hear and interpreted the hadith of the well of Badr (which contained the corpses of the disbelievers) [in this way]. A group of ‘ulama agreed with her on this. Al-Qadi Abu Ya’la from the great Hanbalis preferred this view. Ibn al-Humam (Allah have mercy on him) mentioned that most Hanafi scholars take the view that the dead do not hear, using as proof His statement (Most High) “Truly thou canst not cause the dead to listen” (27:80) and “Thou canst not make those to hear who are (buried) in graves” (35:22) and for this reason, the Hanafis say: if one swears he will not speak to someone and he speaks to him when he is dead, he has not broken his oath. The hadith of the chapter proves unequivocally that the dead hears the noise of the sandals of his companions. It is also authenticated from the Prophet (Allah bless him and grant him peace) according to a hadith that is to come shortly that he addressed the disbelievers from the dead of Badr and said to the Companions (Allah be pleased with them): “You do not hear better [than them] to what I say to them.” The two shaykhs [Bukhari and Muslim] transmitted it. Despite this preponderant view in this issue, the moderate verifiers from the ‘ulama, did not adopt it. [They took the view that] it is the norm in the dead that they cannot hear, but it is not impossible that Allah Most High makes them hear a speech in some situations by way of breaking the norm and such an incidence has been established in the hadith of this chapter, in the hadith of the dead of Badr and in the hadith of ibn ‘Abbas which ibn ‘Abd al-Barr narrated and authenticated. Hence, it is required that we believe in the hearing [of the dead] in these instances and stop short [at giving judgment] about other instances which no text is recorded about. My father ‘Allamah Mufti Muhammad Shafi’ (Allah have mercy on him) said in his Ahkam al-Qur’an (3:168): “The view of the generalisation of the hearing of the dead in every part of every moment is a statement [expressing] that which you have no knowledge and the view of its complete negation rivals the aforementioned cited texts. For this reason we say it is established in general, I mean in some times and not other times, for one person and not other persons, in some speech and not other speech, and by this explanation the texts and the cited narrations in this topic are in agreement.” He (Allah have mercy on him) wrote at length in verifying this issue, listed the texts and narrations pertaining to it and spoke about them with moderation and balance in which the hearts find rest and the chest finds relief so whoever wants further detail should refer to it. The bodies of the Prophets are preserved and remain intact in the grave. This is mentioned by Rasulullah [sallallaahu alayhi wasallam] himself and is authentically proven. The Prophets are also alive in their graves. We do not know the reality and exact nature of the life of the Prophets [alayhis salaam] in their graves. However, it is mentioned in the Hadith that when a person comes to visit Rasulullah [sallallaahu alayhi wasallam] and greets Rasulullah [sallallaahu alayhi wasallam], he (Rasulullah) hears the greeting and also replies to the greeting. When a person sends greetings to Rasulullah [sallallaahu alayhi wasallam] from far, the angels carry that salaams and convey it to Rasulullah [sallallaahu alayhi wasallam]. We are unaware of the terminology of Hayatees and Mamathees, however they seem to be referring to the famous controversial topic of Hayatul Ambiyaa (Are the Prophets Alaihimus Salam alive in their graves). The view of the wahabi/Salafis is that Nabi sallalahu Alaihi wasallam and all the other ambiyaa as well are not alive in their grave. This view has been incorrectly attributed to the Ulama of Depband. The correct view on the topic is that the Ambiyaa and Shuhadaa are alive in their graves, in a manner like that of their lives in this world, without having to do any Ibadat etc. (Hayaatun Dunyaweeyah bilaa Takleefin). This is the unanimous belief of the Ulama of Deoband and has been mentioned in the book “AL-Muhannad alal Mufannad” (Pg. 38) which clearly states the beliefs of the Ulama of deoband and which as been attested to by all the senior Ulama of deoband. We are unaware of who is an Uthmani. With regard to question no 3195 & 7729. Dear Mufti, could you give us proof from Qur’an and Sunnah what you have explain[ed] and you cliam that Ahlus sunnah Wal Jamaa beleive prophet Muhammed (saw) is alive in his grave…. These Ahaadith explicitly prove that after a person passes away, he enters into a different phase of living and this is the life of Barzakh. However, in regards to this life there are various levels. Allah Ta’ala says in regards to the Shuhadaa, “And do not term those who have been killed in the path of Allah as dead. In fact, they are living but you perceive not.” (Baqarah 153). From here, it is even more evident that a person dying in the world does not affect his status of being alive in the life of Barzakh. The question that now arises is, what is the meaning of them being alive? Mufti Shafi (RA) commentating on this verse in his Ma’ariful Qur’aan explains, “It is well known that from the Islamic viewpoint, every dead person has a special type of life in Barzakh through which he experiences either punishment or enjoyment. However, there are different levels in this life. There is the level which is general for all, and there are special levels for the Ambiyaa, the martyrs and the pious.” With regards to the reality of those levels, the best explanation is given by Moulana Ashraf Ali Thanwi (RA) in his Bayaanul Qur’aan. The lives of the Anbiyaa (Alayhis salaam) are also proven through the Ahaadith of Mi’raaj narrated by Bukhari and Muslim where it is mentioned that Nabi (Sallallaahu Alayhi Wasallam) led the Anbiyaa (Alayhis salaam) in Salaat and also his meeting them in Jannah. “…The mamatis have been categorically rejected by all the senior Deobandi scholars of our times, many seminaries in Pakistan don’t even allow them admission and they are booted out if caught studying under-cover. Our scholars consider them outside the fold of Ahl al-Sunnah wa ‘l-Jama’ah. Nobody does their takfir although there have been a few among their ranks who have fallen into kufr because in trying to deny the hayat of the Prophet they went so far that they ended up insulting and disrespecting the Prophet .May Allah save us from their evil. The Aqidah of Hayat al-Anbiya is certainly an essential aspect of our maslak, those who deny it should not associate themselves with the Akabir of Deoband. In the eyes of our ‘ulama, there is no valid ikhtilaf on this issue. 4. and it is similar to the Dunyawi Life. It is only that they are not burdened with the laws of Shari’ah. Nonetheless, they even offer prayers. That blessing (durud) which is recited at the sacred garden [i.e. the grave], he hears it directly. This is the way of the majority of the hadith masters and the theologians of the Ahl al-Sunnah. Such clarifications are available in various treatises of the elders of Deoband. An independent write-up of Hazrat Mawlana Muhammad Qasim Nanotwi (Allah have mercy on him) on the life of the prophets with the title Abe Hayat is available. Hazrat Mawlana Khalil Ahmad Sahib (Allah have mercy on him), who was from the most upright of the successors of Hazrat Mawlana Rashid Ahmad Gangohi (Allah have mercy on him), his treatise al-Muhannad ‘ala l-Mufannad is sufficient for the people of fairness and the people of insight. At present, those who assert [a belief] contrary to this way, this much is certain, that they have no connection to the way of the elders of Deoband. And Allah speaks the Truth, and He guides to the [right] path. These are ten in total.